SUNDAY MORNING UPDATE: Peter Ould has done a fascinating “side by side” analysis of the marriage liturgy used in the church “wedding” ceremony of the two male priests in the Church of England. You can read it all here. During one of my periodical sojourns to London to visit family, I remember reading an article in one of the major papers berating the then-Prime Minister Tony Blair for permitting former government ministers access to current government ministers. The paper was up in arms over the practice, shouting about it’s unethical standards and engaging in a rhetorical meltdown over the horror of it all. About four paragraphs into the article, the paper finally describes the practice as it is called in United States: lobbying. American-style street politics has been raging through the Episcopal Church for quite some time now, since the 60s ended and the lesser political activists went searching for new venues, some quickly discovering the Episcopal Church, a perfect venue with it’s overwrought governmental structures and it’s bourgeoisie facades. Perfect! For thirty years the street activists – one can hardly call them liberal – labored away, going to endless meetings and taking minutes, getting elected to councils and taking minutes, getting ordained and taking minutes. At the same time, the renewal was also underway but the great majority of those leaders intentionally stayed clear of the political realm, leaving the house without adult supervision. Now those same street-style political strategies are crossing the Atlantic and one of the first public examples of this comes in the news today from London. A “Priest Vicar” at Westminster Abbey, the Rev. Peter Cowell, has “married” another COE priest, the Rev. Dr. David Lord, in the Church of England’s Diocese of London. They were married using an adaption of the marriage service from the Book of Common Prayer, complete with rings, vows, and the Eucharist. Their liturgical imagery was to eroticise the relationship between King David and Jonathon. 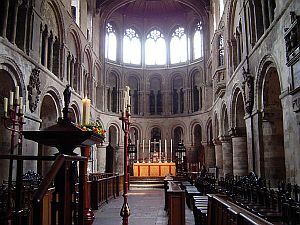 The marriage between the two men was held inside one of London’s historic churches, St. Bartholomew the Great within a stone’s throw from our old college hangout, the Barbican. What will the Archbishop of Canterbury and the Bishop of London do about it? Now, while the activists will emphasize that we should send the toasters and gift cards, the point remains that this was a direct political action. It’s goal is political. It was timed to coincide just as GAFCON is convening and a month out before Lambeth. Last weekend we had Gene Robinson’s wedding in the Episcopal Church. Looks like the brethren in England did not want to let him hog all the limelight. But what it means is that the COE activists have borrowed the infamous TEC activists’ playbook of recent years. When there is organized opposition to their marketed strategy of prophetic inclusion, then it’s time for drama. Now that drama is crossing the Atlantic from Minneapolis to London on the eve of the Lambeth Conference. We remember that Bishop John Spong had a meltdown in a letter to the Archbishop of Canterbury where he accused Rowan Williams of ecclesiastical treason, that Rowan Williams was picked because he endorsed by word and action the inclusion of men marrying men and women marrying women. When Dr. Williams made several key decisions that undermined those activist goals, the street activists in the Episcopal Church were outraged. They were emboldened when Rowan Williams was appointed the new Archbishop of Canterbury. They threw all caution to the wind and flew forward at an accelerated pace, confident that Canterbury would not blink but look the other way. The Episcopal activists were very worried that their momentum had peaked at Denver’s General Convention and if they did not move fast, they be set back decades. Their base of support was aging – who could guarantee that they would have sufficient numbers in another 20 years to achieve their political goals? It did not look good. The resistance from the orthodox at Denver 2000 shocked them into taking a more drastic and dramatic steps along a different route to force the Communion to comply (never dreaming that they could not control the developing structures of the Anglican Communion as they had for decades with their handouts and their creation and funding of the Anglican Consultative Council – ACC). While they had control of the structures, the structures were a fallacy – they were so heavily manipulated that they gave 815 and the base a sense of security that was not – and is not – there. They were hoisted by their own petard. Now we see the activists in the Church of England employing the same kind of political strategy. Since their bishops are appointed ultimately by Queen Elizabeth, consecrating a bishop to fit their political agenda is not going to be their mode of opererations. They couldn’t risk what they can’t control. So they picked a priest associated with the iconic Westminster Abbey to tie the church in knots instead. Apparently the Rev. Peter Cowell is also attached to St Bartholomew the Less Smithfield Gate, which is a very old chapel at St. Bartholomew’s hospital. He is an adviser to the Bishop of London on hospital chaplaincies. He preaches at St. Margaret’s, part of the Westminster Abbey purview and the official church of Parliament. Parliament. No, we’re not talking about a simple country vicar. A very interesting bit about the venue, St. Bartholomew the Great Church. It has very clear ties to American benefactors. It’s the classic set of a an Anglican Church and you go in there and poke around and not be stuck in long queues with steep fees as you would at Westminster Abbey. Their website has an entire page devoted to reach out to its American donors. Last weekend we had Bishop Gene Robinson’s wedding in an Episcopal Church in the Diocese of New Hampshire. This weekend we have the wedding of a priest from Westminster Abbey marrying another male priest in a London COE Church. It’s not about love, it’s not about marriage – it’s about street activism in the run-up to Lambeth and we wonder if it’s not a sign that things may not be boding well for the progressives (we still don’t know how The Episcopal Church is paying the millions and millions of dollars for their litigation warfare). It might behoove us all to take stock in the fact that the activists in TEC and now the Church of England have given up on working patiently inside the church structures and instead have taken to the streets with their direct ecclesiastical political activism. This puts lobbying out the window and kicked off the ledge. The attention now turns to the Bishop of London – what will he do? A story from last April is displayed prominently on the front page of the St. Bartholomew the Great’s webpage. What will he do? And Westminster Abbey, as I recall, has a separate covering – what will they do? Interesting tidbit. On May 1, it was announced that Sir Stephen Lamport, former Private Secretary to Prince Charles, The Prince of Wales, has been appointed Receiver General of Westminster Abbey. He will take up his new post later this year. “The post of Receiver General is the most senior lay position at the Abbey where Sir Stephen will take charge of nearly 200 staff and an organization with a turnover of more than £10 million a year,” the press release includes. So obviously, a priest connected to Westminster Abbey will have royal attention as well (as an aside, we do wonder if, with this appointment, there is preparation all ready underway for the Succession). Needless to say, it’s effective to have a priest vicar from Westminster Abbey getting married to his male partner to be assured of getting attention – royal or not. If British Anglicans thought the mess was just over here on our side of the pond and we are left to sort it out, it is time to wake up and smell the hot tea brewing. Otherwise, plan to pop down to Marks and Sparks for that special little gift. Indeed, there will be more special events to come. This entry was posted in Anglican News, Archbishop of Canterbury, Episcopal News, General Convention, http://schemas.google.com/blogger/2008/kind#post, Lambeth Conference, Podcasts. Bookmark the permalink. “It might behoove us all to take stock in the fact that the activists in TEC and now the Church of England have given up on working patiently inside the church structures and instead have taken to the streets with their direct ecclesiastical political activism. This puts lobbying out the window and kicked off the ledge.”I am not sure I understand what you are thinking. I was just thinking this was the usual “fact on the ground” tactic that actually supports the lobbying by creating pressure to conform to the new reality. I’ll say it if no one else will, Anathema, Anathema, Anathema! This whole little ceremony isn’t especially surprising. But what will be interesting is what the CoE heirarchy will do about it. Will they have the courage of their convictions, will they treat it as something prophetic or will attempt to ignore it and hope it goes away? C of Hierarchy, courage, and convictions? Where’s the Spanish armada when you need them? That’s interesting.If I understand you rightly, you are saying the Anglican left rushed its liberation program because it knew it was aging and losing strength & numbers. Maybe, but weren’t ECUSA’s numbers pretty good in the late ’90s? They may have thought they had the numbers to go ahead. What about this instead: they saw, esp after Lambeth ’98, that they were losing strength and numbers outide North America/some other “first world” provinces, and thought Williams’ tenure would provide their one shot to push the liberation program through They did not realize the horse had already long left the barn.